This is the story about the border. Not a high, stone border, neither iron border. It is a thin line which separates "better from worse" and "big from small". It is a border in the head, set by the people. Series of photos named “Life on the border” represent lives of the three communities in the northeastern part of Slovenia. 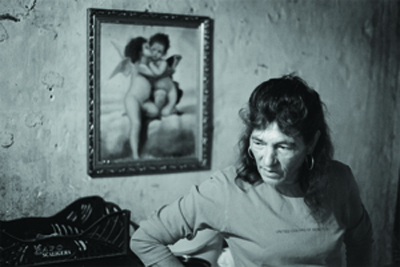 Gypsies, older people and disabled persons all share the same feature; they live on “the other side of the border”. They are considered as some kind of foreign bodies in the society. “Normal” people do not care who these people are and how they feel. They are limited and isolated because they do not meet the “standards”. In this story I try to present them in their own environment without prejudices, just as they are - special and unique. And the border, that once existed, has magically disappeared. At first I studied Japanese and Spanish languages and culture. Later I’ve enrolled in photographic studies in Slovenia and later in Paris. My diploma focused on Japanese Postwar Photography. My main interests were the documentary and authorial photography based primarily on social themes and later also themes associated with my identity (women's issue, unemployment).